Do you experience extreme self-doubt, uncertainty, and fear in social situations? Does this anxiety impact your ability to comfortably interact with others in your day-today life? If so, this group might be for you. Student Counseling Services is offering group therapy for students who are struggling with social anxiety and social skills. Group therapy provides a safe space to practice skills, with the support and guidance of a therapist and your peers. It can be a highly effective approach to reducing social anxiety and increasing self-esteem. Confidential group sessions will be held weekly in 303 Bunting Center, with a focus on increasing self-confidence through participation in creative group activities. Students will develop skills in communication, assertiveness, and self-awareness that will support them in relationships and as they prepare to transition into professional work. Sessions will be facilitated by MICA counselor Rebecca Miller, M.A.. Please contact the Student Counseling Center if you are intersted in joining this group and to complete a 1:1 intake session with Rebecca Miller to discuss your needs and answer questions. 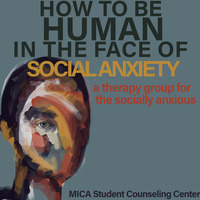 Students can email the SCC at counseling@mica.edu or call 410.225.2367. Group participants will be elidgible to win a journal. New to counseling and therapy? Great! We would love to meet you and discuss how SCC can best support you!